We've hosted some exciting events this year at Turnrow. Our own Jamie Kornegay launched his debut novel Soil here at the store on March 10. A few weeks later we packed the house for Greg Iles, who signed and spoke about The Bone Tree, the second installment in his Natchez Burning trilogy. Later in the spring we hosted DJ and musicologist Robin Tolleson who presented a 'spin-terview' on Greenwood's native jazz pianist, the late Mulgrew Miller. And this August Turnrow will present its own theatrical production for the first time. Performances of David Mamet's Pulitzer Prize-winning 1983 play Glengarry Glen Ross will run from August 13-15 right here in the front of our store. Glengarry Glen Ross takes place over two days in a downtrodden Chicago real estate office. Prompted by a particularly cutthroat sales competition, the realtors take increasingly desperate measures to hang on to their jobs. Pandering, deception, bribery, blackmail, and robbery are only the beginning. And Mamet lets his characters stretch and distort every possible means of 'selling' something, whether it's property or their own integrity. The original productions of the play in London and on Broadway led to a film adaptation in 1992 with an all-star cast that quickly became a cult classic. Proceeds from tickets will directly benefit our partner the Greenwood Mentoring Group, which provides tutoring and activities for area youth. Tickets can be purchased for all three nights at our website or here at the store. Get your tickets early! We expect to sell out every show very soon. Doors will open at 6:30 with drinks available to purchase. Some surprise guests will be joining us for a special event each night at 6:45 and the show starts at 7:30. Please note: this play contains pervasive adult content and language. No person under 18 will be admitted. In the years since we established A CHILD’S FIRST BOOK CLUB, we have watched as its numbers and popularity have grown along with its readers. What started as a fun way to help parents build a home library of great picture books for their children has blossomed into a major operation with subscribers in sixteen states and new members signing up each month. But some of our young readers have been with us so long that they’re beginning to pick up chapter books and novels with less illustrations and more emphasis on fantastic storytelling. To meet the appetites and aspirations of these readers, we’re moving on with them to the next step: THE STORY FIRST BOOK CLUB for discerning young readers. The audience for this book club will be kids in Grades 4-8, but of course it’s open to fans of great fiction of all ages. The new club will build on the successful formula from the original kids club. Every month subscribers will receive a signed first edition of a brand new book for young readers. The books will come with our customary pen pal letter, along with an invitation to meet and discuss the latest selection with other members in an afternoon gathering here at the store. Who knows – the authors themselves may join us! To launch such an exciting new venture, we’ve picked a spectacular new book to match it: debut novelist Cassie Beasley’s CIRCUS MIRANDUS. It's the story of a boy named Micah and his Grandpa Ephraim. Grandpa used to entertain Micah with tales about a mythical circus he supposedly visited as a boy. But when Grandpa becomes seriously ill, he sends Micah on a fateful mission: find the real Circus Mirandus and seek out its greatest magician -- the Lightbender, who just might be able to save Grandpa's life before it's too late. So join us as we embark together on this new adventure! Sign up today by calling Turnrow at 662.453.5995 or visiting us here in the store. See you this summer at Turnrow Books! How better to kick off the new Turnrow Book Discussion Group than with a novel born out of this very land and told by a compelling new voice in Mississippi letters? Jonathan Odell, a Mississippi native whose novel The Healing was a surprise bestseller in 2012, will be here this Wednesday, May 20, to sign and read from his new novel, Miss Hazel and the Rosa Parks League. We'll be discussing the novel at our inaugural book club meeting on June 4, but we encourage you to come out this Wednesday at 5:30 p.m. to meet the author and hear him speak about the book. As for finding a specific town in which to place my characters, it wasn't until later, quite by accident, that I turned off Highway 82 and found myself in one of the most enchanting, picturesque towns in Mississippi. I had never even heard of Carrollton and figured it had to be one of Mississippi's best-kept secrets. It was such a contrast to the flattened out places I had been exploring! Splendid homes, filled with history from the earliest days of Mississippi statehood were nestled like gems in the winding lanes. I knew this had to be my literary town and has served as such in all three novels, and will in the fourth as well. When I read the lovely memoir, Landscapes of the Heart, by Carrollton's illustrious literary citizen Elizabeth Spencer, I was sold. I rechristened Carrollton "Delphi," for the site on Mount Parnassus home to the ancient oracles sought out by travelers the world over for a glimpse into their futures. It fit, because each of my major characters arrive in Delphi, Mississippi, for the same reason, to seek out a new future. My fictional county, Hopalachie, is actually the combined counties of Leflore and Carroll. It roughly translates from Choctaw as "to calm the waters." I'm eternally grateful to the proud Mississippians for providing me the most interesting array of characters with whom any author has been blessed. I only hope that through my imperfect prose, they can sense the love I have for their home. Like so many visions from that time, the nightmarish spectacle of Nazi public book burnings is hard to forget. It's not just the sight of thousands of books in flames -- it's the thunder of the brass and drums, the pageantry of the uniforms and flags, the maniacal glee on the faces of the young men hurling books into the inferno. But a question continues to worm away: which books are they burning? What texts are so incendiary (no pun intended) that they need to be not just banned or redacted, but ceremoniously destroyed? An answer of sorts arrives in Blood Brothers, Ernst Haffner's 1932 novel now being republished in a translation by Michael Hofmann (who also gave us 2013 favorite Every Man Dies Alone) for Other Press. In fact, we know this to be a book that the Nazis banned and burned. But it also answers a more disturbing question about that scene: who are those boys throwing the books? Why are they laughing? And where do they fit in the story of Hitler's Germany? Blood Brothers is a strange little book, even before Chapter 1 begins. 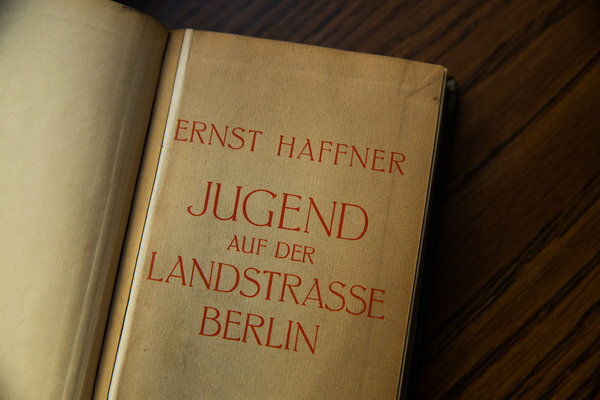 Haffner was a social worker and journalist in the shaky peace of 1920s and 30s Weimar Germany. Blood Brothers was published in 1932 as Jugend auf der Landstrasse Berlin [Youth on the road to Berlin] and banned by the ascendant National Socialist Party one year later. All traces of Haffner vanish in 1940. As far as we know, this is his only work. (Read more about Haffner and the background of Blood Brothers in this great New York Times piece). And yet there are hundreds of journalists and writers who would have killed to write this book. It is passionately, angrily partisan but avoids the soapbox, promoting plot over pamphleteering. It's hyper-realistic and somehow anti-cynical. Even 80 years later, it remains fresh and startling to read, maybe because of its unique prose style, or because its lessons still need to be learned. It's decidedly of its time and place and yet shockingly relevant to urban America in 2015. "Eight Blood Brothers -- tiny individual links of an exhausted human chain stretching across the factory yard and winding up two flights of stairs -- stand and wait among hundreds of others to be admitted from the awful damp cold into the warm waiting rooms. Just three or four minutes to go now. Then, on the dot of eight, the heavy iron door on the second floor will be unlocked...the coiled line jerks into life." It is with this restless tone that Haffner unspools the entire tale. For the Blood Brothers, life is tedious, uncertain, gray, cold, and hungry. The only comfort is from each other and the only excitement comes from bursts of feverish activity. Thus, even when they are waiting in line, sleeping on the floor of an abandoned train station, or grinding their teeth in an institutional cot, Haffner keeps the language recklessly brisk. In this book there are no recollections, no scene-setting, no lengthy descriptions, no meditations on motive, character, purpose, or the greater world. It's all action all the time, and the effect on the reader is intense and dizzying. "The icy wind drills deeper and deeper into his clothes, bites under the strips of material wound round his trunk. The body hanging there, stock still, loses its flexibility, becomes numb. Willi can no longer feel his hands cramping in their handholds, he can no longer move his fingers. He can't even feel himself hanging on the axle. All he feels is his body hurtling along at incredible speed, as though shot from a gun. He feels the occasional dull thump of a stone hitting him, but it's not a pain as such. He is released from his physical self, from time and space. How long has he been hanging like this? Is it one hour, is it four?" Does it need to be restated? The whole book is like this! The only reason to stop reading before you finish it is to take a breath. This stylistic feat would be enough to recommend the book, but its greater implications are what push it over the top. It seems like this period - 1930s Germany - is repeatedly invoked to warn people about the insidious evil they are blindly submitting to, as if comparing anything to the advent of World War II has ever been accurate or appropriate. The work that comes quickly to mind is Tony Kushner's 1985 A Bright Room Called Day. Also set in Berlin in 1932, Kushner's play centers on an upper class coterie of artists and actors who feebly attempt to maintain their way of life in the gathering storm of the Weimar Republic. By switching between 1932 and then-present-day America, Kushner (not very subtly) suggests that the Reagan administration is an echo of that chaotic time of misplaced idealism. Where Bright Room falters is in attempting the comparison. Blood Brothers, in contrast, never tries to make itself bigger than the boys themselves, and this is exactly what makes it so frighteningly relevant. The Brothers are not so much cogs in a system as the clods of dirt that are crushed by its gears. There are no adults in the book. Indeed, there are welfare workers, cops, guards, and citizens, but they are only the faceless, inhuman tools of bureaucracy. When Willi and Ludwig are finally reunited, they make one last desperate attempt at the straight-and-narrow life. Since they're under 21 and without documentation or guardians, it's nearly impossible. And near the end, the smallest slip-up spells disaster for them. The horrifying similarity to today's America is not in the suggestion that we are living in some new dawn of evil Fascism, but that our own dispassionate bureaucracy is the same machine that threatens to crush the Blood Brothers. Who knows -- Haffner himself may have been one of its victims. And so it is obvious now why the Nazis destroyed this book. It completely upended their assertion that organizations like the Hitler Youth and Labor Service eradicated inner city crime and gave purpose to shiftless young men. But the Blood Brothers were swallowed up by these groups -- the same institutions they knew but covered in a different shade of cheap paint. They were still there as the machine rumbled toward a new kind of war. And they are the same boys whose laughing faces seem so haunting in those scenes of public burning. We'd be wrong to think their exhilarated grins come from the gleeful destruction of literature. Rather, their gleaming eyes in those mountains of flame reflect the same elation they once chased in the streets of Berlin.